A schooner on Grand Traverse Bay becomes the stage on which new futures are born for these foster kids. 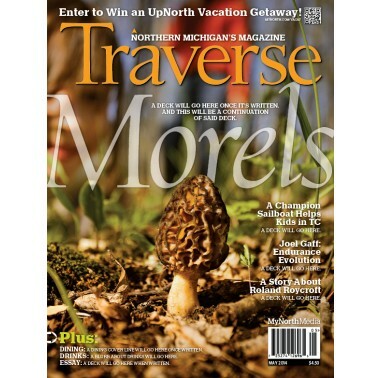 Recipes and backstory from the Rowe Inn’s iconic morel dinner series, a nearly four-decade tradition. World-renowned watercolor painter Roland Roycraft discovered his passion for the art in his 50s, while driving a school bus along Benzie County back roads. Meet two men who grew up running the hills and shores of Northern Michigan and who are now building a business spreading the gospel of a fit life Up North. : KJ Scarpace invents a fish lure; book about outsider Bible artist Ed Lantzer; Karl Haas (classical music show legend) would be 100, attend the party! Big welcome for birders on Beaver Island. :Yes, friend, spring is real. Soak it up at a May event! Travel: Irresistible golf packages for you and the crew. Up in Michigan: Camping, it’s good family time, right? Kate Bassett considers. :Menus inspired by spring flavors. :New releases from Old Mission Peninsula wineries! :Ahh, May. Feel the verve. Of course it is. Spectacularly kept county roads that offer hills and valleys are perfect for pushing yourself on a bike. Miles and miles of fresh water provide a current strong enough in Lake Michigan to challenge veteran swimmers. Paths and roadways allow running to your heart's content. Seemingly endless rivers help paddlers train for obstacles and portages.